'We’re just like you.' Photo by Ted Friedman. They rolled up to People’s Park in two cars filled with clothing, which was scattered, each day, on the sidewalk alongside People’s Park. The merry band of young off-the-road, fur-hatted itinerants made a monster mess with sleeping bags, cardboard, and assorted junk off-the-streets— across the street from the park. 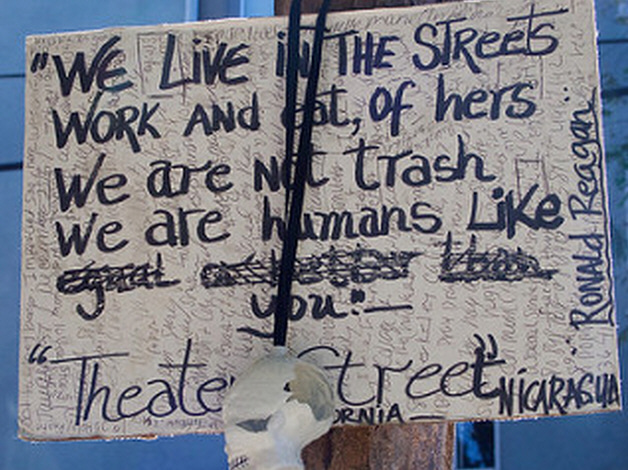 Each day, they displayed a poster board, which referred to street theater, Ronald Reagan, and the 1985 Iran-Contras brouhaha. Perhaps there was a backstory here.Only I never found out because they slipped out of Berkeley like lambs who arrived as Lions. Before I could interview them. Biggest film shoot at the Med since Mike Nichols,’ the Graduate, 1967. 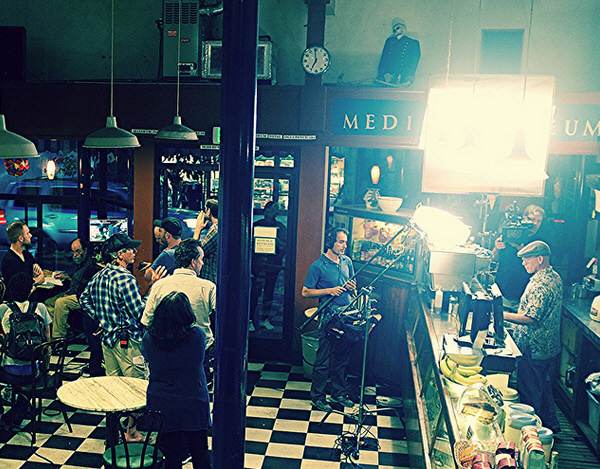 Claiming to be filming for Kohl’s department stores, a 15-man film/production crew, two film trucks, two big video cams, and aspiring actors took over the Caffe Med last week. Gold in them thar hills. Photo by Ted Friedman. Dave said he metal-detected People’s Park monthly. 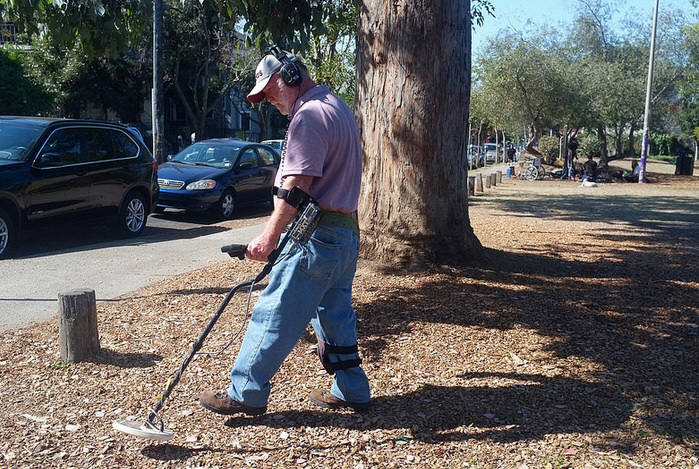 He long ago recouped the money he spent on his metal detector, roughly $800. Reporter commented this isn’t the most lucrative patch in Berkeley. “You’d be surprised,” said Dave. Park people panhandle a bonanza in change, but it falls out of their pockets and becomes buried,” he told me. Dave said he earns $80 a month detecting. Once Dave found a rare-cut diamond/ring that was worth thousands. He gave it to his girlfriend. Kiss the Blood from My Meat! What's left of a bloodless meal. Photo by Ted Friedman. RARE: “HOW DO YOU LIKE YOUR MEAT…RARE”! A Roar From A Telegraph Ave. Character We Call ‘Rare’. 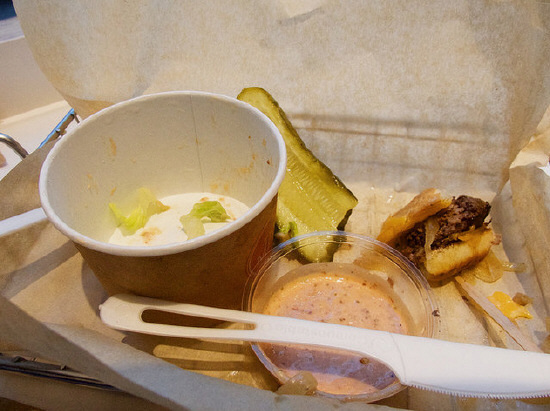 The Melt burger was too good to be true, so it had to die.